New nice apartment with two bedrooms and 2,5 bathrooms. 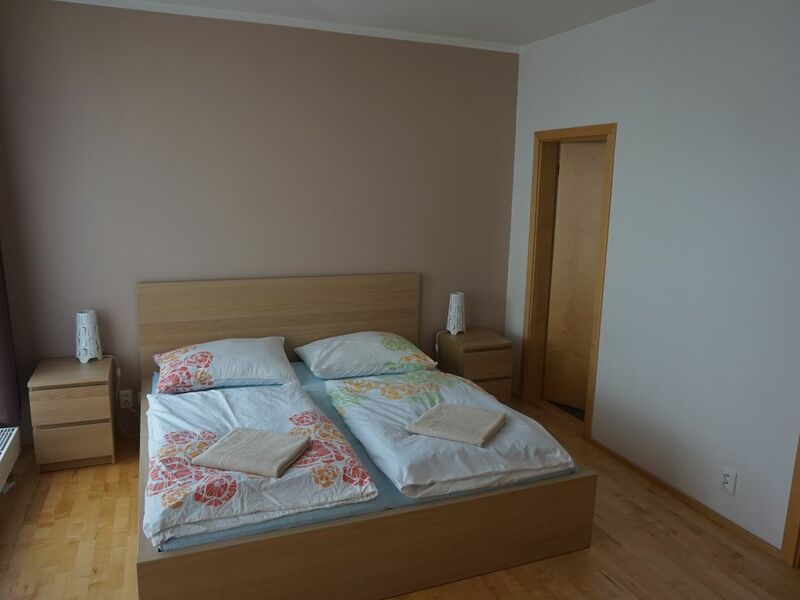 Apartment is located few steps from a great part of nature but 5 min walk from tram station Spojovaci. From Spojovaci tram station you will get to the heart of the city of Prague by 20 min. Kaufland a big food store is located just min walk and is open till midnight. There is also living room with folding sofa, it has a measurement as a full size bed. There is a WI-FI only for the apartment. There a dining corner for 4 people. There is a one big terrace and one small balcony. We booked the apartment for four days and had a very nice stay. The contact and communication was fast and uncomplicated. The apartment is clean and tidy. There are 2 bedrooms, 1living room, 3 bathrooms (1 bigger room with a shower, bathtube and wc, 1 smaller room with a shower and wc and 1 wc) and a kitchen. The apartment has a balcony for using alone and a terasse for using with your neighbor. The main kitchen utensils are available, potholders should be brought. The neighborhood is calm. A supermarket is only a few minutes away. With the tram you can reach the city in about 20 minutes. We would book the apartment again if we go to Prague. Situé dans un quartier résidentiel calme, l'appartement est propre et très fonctionnel (2 salles d'eau et 3 WC ! ). Il y a un supermarché bien fourni juste en face et il est ouvert même le dimanche. Il n'y a pas d'emplacement de parking privé mais on a toujours trouvé facilement une place pour se garer. l'appartement deviendrait un hébergement presque parfait.